The Galley of this oil rig needed to be totally stripped back ready for the new floors and coves. 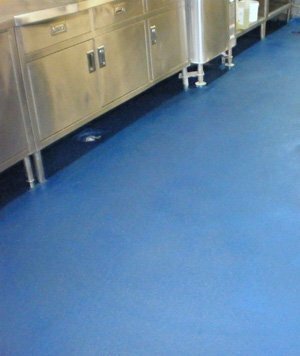 Once the initial tile removal began it was determined that the subfloor in some areas was not suitable to apply on, so areas were completely removed up to 50mm thick and re-screeded to achieve a suitable sub floor ready to apply the 8mm thick polyester based floor and coving system. All preparation was done with little disturbance to crew and the job was finished to specification incident and injury free and within the required time frame.